A high school football coach has lost his job and now a mom and dad are calling for a priest to be fired after events at their son’s funeral. Eighteen-year-old Maison Hullibarger died on December 4th. His parents say they knew him to be a young man with dreams and potential. 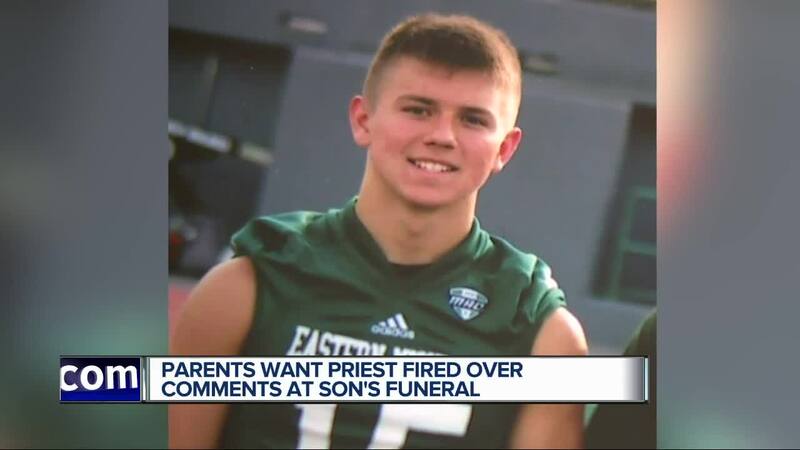 TEMPERANCE, Mich. (WXYZ) — A high school football coach has lost his job and now a mom and dad are calling for a priest to be fired after events at their son’s funeral. Eighteen-year-old Maison Hullibarger died on December 4th. His parents say they knew him to be a young man with dreams and potential. “He was at the University of Toledo. He was a freshman, studying criminal justice. All A’s,” said Linda Hullibarger, Maison’s mom. “He was strong. He was confidant. He enjoyed life,” said Jeff Hullibarger, Maison’s dad. It is hard for his parents to talk about even the good times: How they witnessed that Maison loved his family, enjoyed eating the home cooked meals his mom made, camping, and football. The pain of losing him is unbearable. Everyone who knew and loved Maison is trying to come to terms with why on December 4th he took his own life. His parents say when they met with the Rev. Don LaCuesta at Our Lady of Mount Carmel Catholic Church in Temperance to plan the funeral, the reverend asked what they wanted him to speak about. They told him. Then, when he began to speak during the funeral they say he instead gave what they describe as a lecture on why suicide is a sin, that can condemn you, as you don’t have time alive to repent for taking a life. “I didn’t make a scene. I did it respectfully,” said Mr. Hullibarger. “He didn’t stop. He didn’t miss a beat,” said Mrs. Hullibarger. The Archdiocese of Detroit tells 7 Action News it understands this family’s concerns. We share the family’s grief at such a profound loss. Our hope is always to bring comfort into situations of great pain, through funeral services centered on the love and healing power of Christ. Unfortunately, that did not happen in this case. We understand that an unbearable situation was made even more difficult, and we are sorry. After some reflection, the presider agrees that the family was not served as they should have been served. For the foreseeable future, he will not be preaching at funerals and he will have his other homilies reviewed by a priest mentor. In addition, he has agreed to pursue the assistance he needs in order to become a more effective minister in these difficult situations. We have been in contact with the family since learning of this situation, and we will continue to offer our support going forward. Their son’s former football coach also came under fire for events at the funeral. Bedford High School’s Jeff Wood was asked by a family member to leave the funeral on Saturday. Relatives say Wood had been “unkind” in the past to Maison. Wood responded with a post on Facebook criticizing anyone blaming him for the young man’s death. 7 Action News reached out to Coach Wood for comment, but as of yet have not received a response. The Hullibarger family says they do not blame Coach Wood for their son’s death. They simply did not want him at the funeral. They are more upset about what happened with the priest. “I don’t want to see him do that to anybody else, what he did to us,” said Mr. Hullibarger of the priest. If you are struggling and contemplating suicide, there is help. Please reach out for support. You can always call the National Suicide Prevention Lifeline at 1-800-273-TALK.